The team poses for a photo after their victory, joined by coaches Mr. Timothy Yap, Mr. Tan Yi-Xun and Mr. Suhas Malhotra. 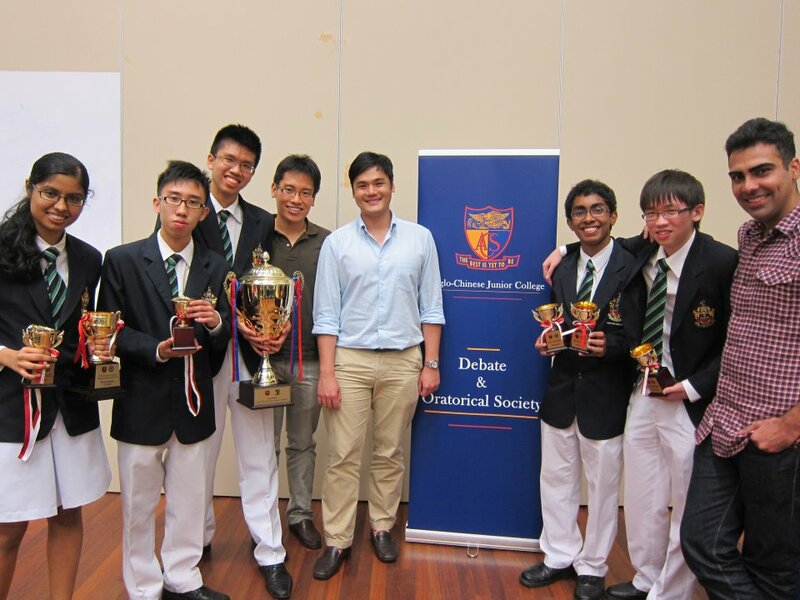 After a 6-year drought, the Raffles Debaters have emerged as the Champions of the Ministry of Education-Anglo Chinese Junior College Inter-Collegiate Debating Championships. The 5-person team, comprising Chua Jun Yan, Antariksh Mahajan, Pavithra Ramkumar, Lim Ying Xuan and Tan Teck Wei, defeated Anglo-Chinese School (Independent) in the Grand Finals by a vote of 4 to 1. The victory was especially sweet, as the team had suffered bruising defeats in tournaments earlier in the year. To reach the finish line, the team had to brave six gruelling debates over two days, facing traditional powerhouses like last year’s winner, Hwa Chong Institution. Debating to a crowd of a few hundred schoolchildren, the team wowed the audience with a sleek blend of style and substance. The motion for the Grand Finals was “This house would abolish the Euro” – a topic which policymakers find challenging to grapple with, much less teenagers studying A-level economics. Nonetheless, RI put forward a convincing case, arguing that the current Eurozone crisis should not blind the continent to the long-term benefits of a common currency. The win marks the end of the season for the CCA, with their secondary school counterparts clinching the national title in April. Once more, the Raffles Debaters have outtalked their way to the top.